Parents.com: Make these adorable Sweet heart kabobs (or is it kebabs? 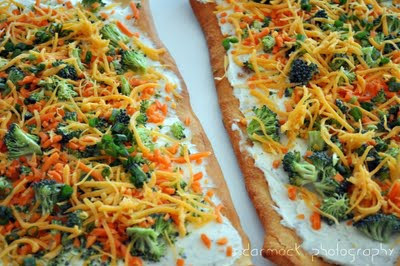 )Perfect for back to school lunches or after school! Joy's Hope: I love this "art of the go" kit, as part of Little Blue Boo's What would you make? Me and my Insanity: Find paper flower cup bling at the showcase of her daughter's fairy party. So many fun ideas! A Pocket Full of Buttons: Wow your friends and family with this easy Veggie Pizza recipe. Looks so yummy! I would love your vote.I don't get anything for winning, just a little extra cool points. :) It asks you to sign up, but you can decline all the newsletters if you wish. And if you are already a member of the Better Homes and Gardens site (which I am -love their room designer), you are good to go. What is the photo you have posted of? It looks delightfully colourful and healthy!